China calligraphy art has historically served several roles, with a balance required between the practical transmission of textual information and the creation of aesthetic impact with brush and ink. 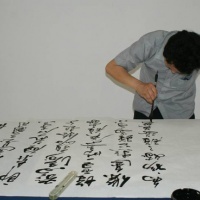 Calligraphy is traditionally been regarded in China as the highest form of visual art. A fine piece of calligraphy was often valued more highly by a collector of art than a good painting. Children were trained at a very early age to write beautifully and good calligraphy was a social asset. A scholar, for example, could not pass his examination to become an official if was a poor calligrapher. A person's character was judged by his handwriting, and elegant handwriting was believed to reveal a person of great refinement. The basic tools of calligraphy are paper, ink, ink-stone (with ink stick) and brush, which are commonly referred to as the 'four treasures of scholar's study'. A brushstroke must be infused with the creative or vital energy which, according to the Taoist, permeates and animates all phenomena of the universe: the mountain, rivers, rocks, trees, insects, animals. Expressive images are drawn from nature to describe the different types of brush stroke; for example, 'rolling waves', 'leap dragon', 'a startled snake slithering off into the grass', 'a dewdrop about to fall' or a 'playing butterfly'. A beautiful piece of calligraphy would therefore conjure up the majestic movements of a landscape. The quality of the brushstrokes are 'bone', 'flesh', 'muscle', and 'blood'; blood, for example, refers to the quality of the ink and varied ink tones created by the degree of moisture of the brush. 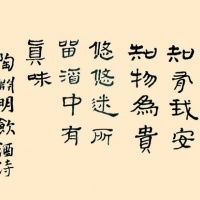 Calligraphy itself is regarded as a form self-cultivation as well as self-expression. It is believed that calligraphy should be able to express and communicate the most ineffable of thoughts and feelings which cannot be conveyed by words. It is often said that looking at calligraphy 'one understands the writer fully, as if meeting him fact to face'. All over China, examples of calligraphy can be fond in temples, adorning the walls of caves, on the sides of mountains, monuments and anything else with a flat or roughly flat surface. There are six basic or typical styles which are divided by writing manners. A major change in the social role and function of calligraphy has occurred in recent years, however, with the widespread adoption of pens, making calligraphy today a more purely aesthetic practice. Hi I am looking for some custom written chinese caligraphy that i need written for me. i been having trouble finding someone who has the authentic artistic sense to write it our for me. i hope you can help me out as to where to find one. thank you for your time. and i am willing to pay for great art. as great art lasts a lifetime.